Introduction: Recovery failures such as sternal dehiscence, sternal pain, sternal wound infections, osteomyelit and mediastinit can be seen after median sternotomy in coroner bypass surgery. In this study, two sternum band closure methods which we find more effective and secure than conventional sternal closure method, are compared. 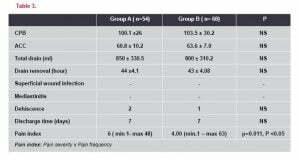 Method: In this prospective study that compares two sternal band closure techniques, 114 patients are divided in two groups as Group A (n=54) and Group B (n=60). This research compares the results for sternal dehiscence, sternal wound infections, sternal pain and mediastinit in these patient groups between December 2011 and July 2012. Results: Out of the two, a meaningful recovery is achieved in Group A compared to Group B (p<0.05). No superficial woud infection, sternal dehiscence and mediastinit are found in patients of both band groups. Conclusion: In this study, two different band closure techniques for sternotomy closure after the coroner bypass surgery are compared, and it is revealed that sternal pain index decreases meaningfully, compared to the other. Sternal bands used in our study are reported to prevent cutting of sternal cortex as tension on sternum is applied on larger and more balanced area, unlike to conventional sternal steel wires. (4-6) The aim of this study to compare two different sternal band closing methods combined by conventional sternal closing method and to report the results. In our clinic, 114 patients (60 males, 54 females; mean age 65,095 years) underwent to open cardiac surgery between December 2011 and July -2012 were prospectively reviewed. Sternal closinmg was performed by Peninsula Sterna –Band® (L.L.C. Livonia MI. USA ) was used in 54 patients consisting first group (group A) and by Ethicon Sternum Band (Norderstedt, Germany) used in 60 patients consisting second group (group B). Patients with pre-operative renal insufficiency, left ventricle dysfunction, patients receiving anticoagulants, those who have hemorrhagic disorder and those who received postoperative over two drains, were not included in the study. 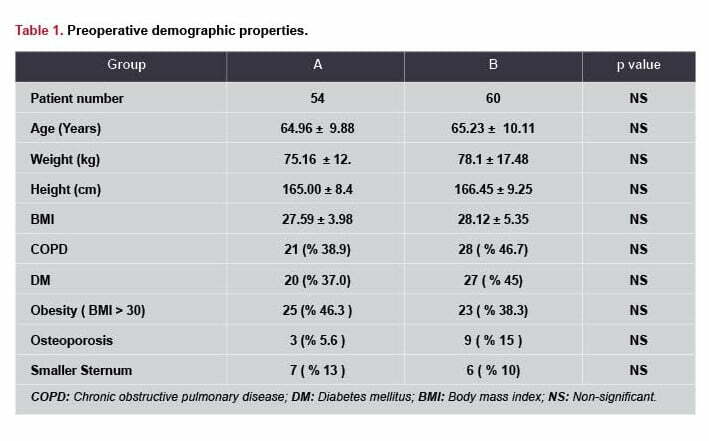 Preoperative demographic properties of patients are shown in Table 1. Anesthetic medication and prophylaxis were identical in both groups. Following standard sterilization, operating area was covered by ioban 2 drape (3M Health Care, St Paul, MN, USA). Following median sternotomy, antegrade cold blood cardioplegia with intervals of 20 minutes and continuous retrograde blood cardioplegia were used with standard cardiopulmonary bypass. Retrosternal two sternal bands at intercostal spaces 3 and 4 and four standard 5/0 steel wires at intercostal spaces 1- 2- 5 and 6 were placed for sternal closing in Group A. In Group B, retrosternal sternal band at intercostal spaces 3 and five standard 5/0 steel wires at intercostal spaces 1- 2- 4-5 and 6 were placed. Then cutaneous and subcutaneous tissues were closed standardly. Following post-operative hemodynamic stability, all patients were ex-tubed at hour 4 to 6 and pain index scoring was obtained following mobilization during post-operative intensive unit care. Pain index was obtained by using pain scoring method Visual Analogue Scale (VAS) to evaluate the effect of both bands on post-operative pain. Patients were verbally asked to rate the presence, frequency and severity of pain on the sternum by a scale of 1 to 10. Pain index scoring was calculated by multiplying post-operative pain frequency by pain severity. Statistical analysis was performed by SPSS 15.0 version for Windows (SPSS Inc., Chicago, Illınois, USA) software. T-Test, Pearson Chi-Square test and Mann-Whitney test were used for data analysis. Statistical data was expressed as mean ± standard deviation and significance was considered as p < 0.05. The study was approved by Süleyman Demirel University Faculty of Medicine Scientific Study Projects Consulting Coordinating Board by project number B.30.2.SDU.0.20.05.07-507/5077 on 27.12.2011 and board decision no. 27/6. Pre-operative demographics were not statistically significantly different between two groups (Table 1). Surgery type of operated patients is shown on Table 2. When peri- and post-operative variables were evaluated, there was no statistical difference in respect of cardiopulmonary bypass time (CPB), aortic cross clamp time (ACC), DR drainage amount, the amount of blood utilized, administration of inotropes, drain removal time, superficial wound infection, mediastinitis, dehiscence and discharge time ( p ˃ 0.05), (Table 3). Mean pain index was 6.00 (min 1 – max 48 ) and 4.00 (min 1 – max 63) in Group A and Group B, respectively. 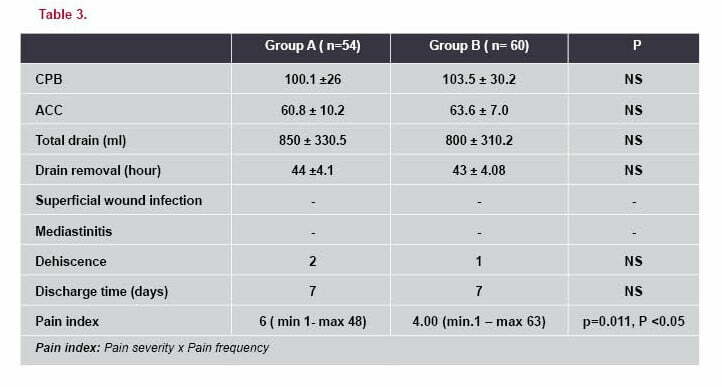 Statistically significant difference was found between two groups in respect of pain index (p = 0.011). Complete closing of sternum following median sternotomy during open cardiac surgery, is a critical point in prevention of postoperative complications due to sternotomy. These complications include mainly dehiscence as well as a broad range of conditions such as pain, superficial wound infection and mediastinitis. Currently several sternal closing methods were described to prevent these complications. (4) Therefore, in our study we compared two different sternal bands used for sternal closing. Closing of sternum is an important factor for sternal dehiscence. During sternal closing done by conventional approach using steel wires 5/0, bone cortex erosion, fracture and consequently sternal dehiscence can occur due to compression of steel wires. Sternal dehiscence may lead to respiratory dysfunction, infection, increased pain and re-exploration. (16) Use of sternal band, especially retrosternal application at intercostal space 3 and 4 to transversely surrounding whole sternum, is the most important mechanism to reduce development of sternal dehiscence with its 6 times larger surface than steel wires and thus providing equal loading on sternum. In our study, sternal dehiscence and sternal wound infection were not detected in both groups. Previous studies comparing sternal band and conventional sternal closing also showed that usage of sternal band was associated with decreased pain and this was explained by reduced development of sternal dehiscence. However, in our study, we determined a difference between different methods of sternal bands in respect of pain development. When two groups of our study were compared, there was significant reduction in post-operative pain development in Group B compared to Group A. At this point, we consider that reduced compression of band method on a smaller bone cortex area only at intercostal space 3 in Group B compared to band method of Group A, could explain lower pain. However, we think that the limited number of studies on pain in cardiac surgery and multifactorial nature of pain are limitations of our study. Although our study is prospective and including low number of patients, we conclude that larger studies will provide more guidance by including psychological and anatomic-physical parameters such as difference in physical load on bone structure by the material utilized. 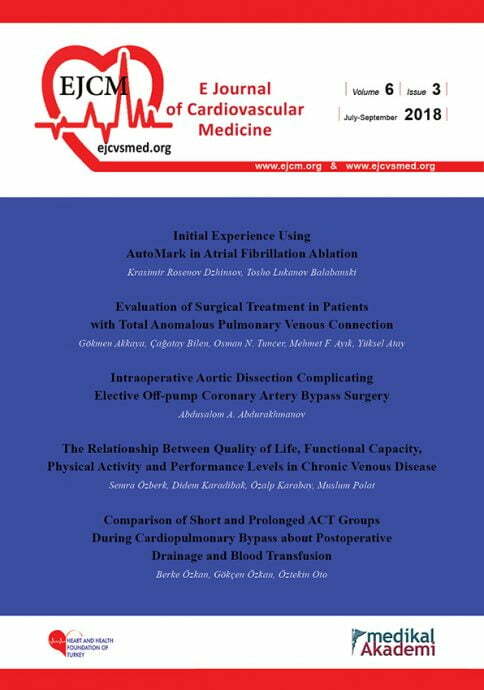 Please cite this article as: Kara K.A., Erk Z., Koçyiğit A., Gülmen Ş., Öcal A., Okutan H. Comparison between two sternum closing techniques by median sternotomy during open cardiac surgery EJCM 2017; 05 (3): 44-49. Doi: 10.15511/ejcm.17.00344. 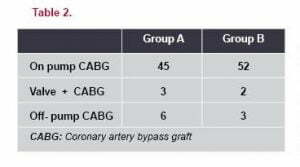 A.Rahman,O Burma.The effect of coronary artery bypass grafting with Cardiopulmonary bypass and beating heart technique on cardiac performance Turkish J Thorac Cardiovasc Surg 2001;9:68-73. H.Ekin,V.Kutay Tek ve İki Damar Hastalarında Çalışan Kalpte ve Kardiyopulmoner Bypass ile Yapılan Myokardiyal Revaskülarizasyonların Karşılaştırılması Van Tıp Dergisi: 2004;11 (3):92-97. Cameron A, Davis KB, Green G, Schaff HV. Coronary bypass surgery with internal-thoracic-artery grafts-effects on survival over a 15-year period.N Engl J Med 1996;334:216-9. Friedrich-Christian Riess,1 Nizar Awwad,1 Bettina Hoffmann. A Steel Band in Addition to 8 Wire Cerclages Reduces the Risk of Sternal Dehiscence after Median Sternotomy. The Heart Surgery Forum 7 (6), 2004. Wewers ME, Lowe NK. A critical review of visual analogue scales in the measurement of clinical phenomena. Research in Nursing & Health 1990;13: 227-236. Uyar M. Postoperatif ağrılı hastanın değerlendirilmesi ve ağrı ölçümü. Yücel A ed. Postoperatif analjezi 1. basım. İstanbul: Mavimer Matbacılık Yayıncılık Ltd. Şti. 2004; 27-36. Rawal N. Postoperatif Ağrının Psikolojik Etkileri Editör: Erdine S. Ağrı. Nobel Tıp Kitabevleri 1.baskı. 2000; 124-125. Mueller XM, Tinguely F, Tevaearai HT ve ark. Pain location, distribution and intensity after cardiac surgery. Chest 2000; 118: 391-6. Moore R, Follette DM, Berkoff HA. Poststernotomy fractures and pain management in open cardiac surgery. Chest 1994; 106: 1339-42. Blanchard A, Hurni M, Ruchat P, et al: Incidence of deep and superficial sternal infection after open heart surgery: A ten years retrospective study from 1981 to 1991. Eur J Cardiothorac Surg 1995; 9: 153-8. 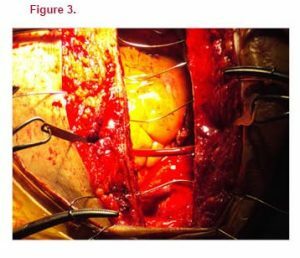 Farinas MC, Peralta FG, Bernal JM, et al: Supurative mediastinitis after open heart surgery: A case-control study covering a seven year period in Santander, Spain. Clin Infect Dis 1995; 20: 272-6. He GW, Ryan WH, Acuff TE, et al: Risk factors for operative mortality and sternal wound infection in bilateral internal mammary artery grafting. J Thorac Cardiovasc Surg 1994; 107: 196-9. Kluytmans JAJW, Mouton JW, Ijzermann EPF, et al: Nasal carriage of staphylococcus aureus as a major risk factor for wound infections after cardiac surgery. J Infect Disc 1995; 171: 216-9. Jurkiewicz MJ, Bostwick J, Hester TR, Bishop JB, Craver J. Infected median sternotomy wound. Ann. Surg. 1980; 191(6):738-43. Catarino PA, Chamberlain MH, Wright NC, Black E. High-Pressure suction drainage via a polyurethane foam in the management of poststernotomy mediastinitis. Ann. Thorac Surg. 2000; 70: 1891-5. Robiscek F, Fokin A, Cook J, Bhatia D. Sternal Instability After Midline Sternotomy. Thorac Cardiov Surg. 2000; 48 (4): 1-8.